Feel Bach! flower remedies blog: Will You Become an Empty Nester This Year? Life is filled with changes, some small and some huge. Likewise, some changes are welcomed while others definitely are not. Many families are facing a major change this year as the children who just finished high school leave the nest to go to college. As a parent, you're pleased and excited for them, but... the change in your life will be substantial. That's especially true if it's the last child. You'll now officially become an "empty nester." 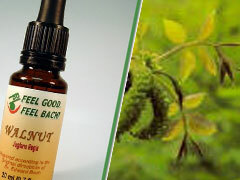 If you're having trouble adjusting to that change, try Dr. Bach's flower essence, Walnut. Walnut helps realign your energies so you can adjust to any kind of change in life - and still function in all your other roles. Next, try getting involved beyond your home. Take those hours you used to spend with your child - or taking care of tasks related to your child - and turn them into volunteer hours for a cause you care about. You could also get more actively involved with a hobby - perhaps one you gave up when you became a parent. Whatever you do, don't sit home and dwell on missing your child. Fill those hours with activity that will make you feel good - even if you don't feel much like doing it the first day. I have worked with the Bach flower range for sometime. After some considerable research into Dr Emoto's - Memory Water Experiments, I have created a range of vibrational rescue remedy for dogs to help relieve underlying emotional issues.